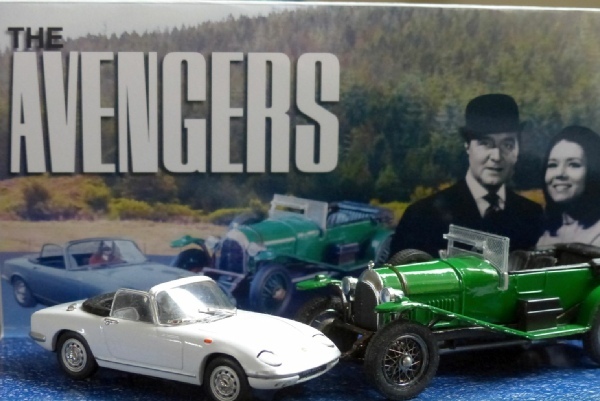 This is a special edition that I have created myself, showing the correct green Bentley for Steed and a white Elan, Mrs Peel’s original car in the TV series.The white Elan is a Vitesse model which is the same scale as the Corgi #318 and beautifully finished with wonderful detailing. Steed’s Bentley is a very smart and accurate Corgi original C861 Special Edition made from the same casting tools as the original. The display is a very attractive folded card unit that I have designed and it has been printed and produced to a high standard, with lots of information on the reverse. The Elan is a limited edition and I will supply the original perspex box, packaging and certificate as well as the original box for the Bentley. The cars and boxes are all as new.